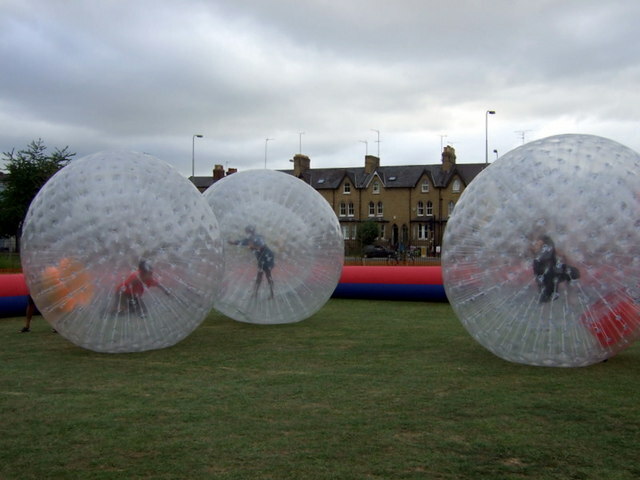 The Cowley Road Fiesta taking place in Headington's South Park offered a chance to sample 'zorbing' in a special arena. Zorbs are plastic globes which can be moved around by a person or person inside. Zorbing was invented in New Zealand and is defined as "a sport in which a participant is secured inside an inner capsule in a large, transparent ball which is then rolled along the ground or down hills". This page has been viewed about 330 times. The footbridge in the third photo happens to be part of my old school grounds, and if the first photo isn't taken from the left-hand one of the two islands it connects, it certainly looks like it :-) The school in question is Magdalen College School. The island on the right is used (and known) as the school field. The island on the left is known as "the Spit"; it's somewhat smaller and wasn't used for much other than Commemoration Tea once a year when I was there (up till 2000), but now it has a fence around it and some small goalposts, so I assume they use it for boys from the Junior School (the building in the background) to have games lessons on.